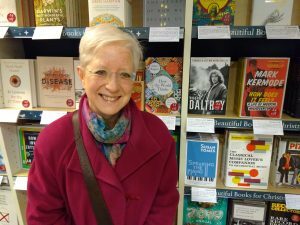 I’m not sure my books have ever before made it into the display at the front of a major bookstore, so it was a thrill to find Speaking the Piano just inside the main door of Blackwell’s Bookshop in Edinburgh (see photo) when we were there to do some Christmas shopping. What’s more, it was right next to my husband Bob’s ‘Companion to Orchestral Music‘, whether by chance or because the bookstore staff knew we were a couple, I don’t know. Anyway, I couldn’t resist getting Bob to take a picture. Inspired by the idea of ‘Books of the Year‘ (see blog post below this one), I have been making my own selection of the books I most enjoyed during the year. Short Stories: Anything is Possible, by Elizabeth Strout. The first book I read in 2018 and one of the finest. I have read all Elizabeth Strout’s books and am sad there is nothing more of hers to look for yet. These short stories recount episodes from the lives of the characters familiar to us from her other books, notably ‘My name is Lucy Barton’, which I saw in its theatrical version in London this year with Laura Linney in the title role. Elizabeth Strout has the gift of entering deeply into her characters’ minds and motives while keeping her descriptions poignantly light. Novel: Days without End, by Sebastian Barry. The Costa Prize-winning tale of a poor Irish boy, Thomas McNulty, who crosses the Atlantic in the 1850s and signs up for the US army together with his great friend and partner John Cole. They encounter all manner of hardships and live though harrowing violence, but are sustained by their love for one another. The author has a staggering ability to describe scenes and feelings so lyrically and empathetically that he often seems to be writing poetry in the medium of prose. Novel: Cloudstreet, by Tim Winton. This was given to me by a lovely Australian house guest who said it would give me some insight into why she missed Australia so much. I had never read anything by Tim Winton before, but was entranced by his visionary prose, his uncanny sensitivity to nature and his love for the rough, tough pioneers of hardscrabble Ozzie life. Vintage Fiction: The Irish RM, by Somerville and Ross (an Anglo-Irish duo of women authors). An anthology of blissfully funny tales, written around 1900, told by Major Yeates, a resident magistrate (the RM of the title) as he attempts to see through the artful shenanigans of rural Ireland and to administer justice as envisaged by an English law which moves in straight lines. Needless to say, the Irish run rings around him in every chapter. I am not much interested in horses, but everyone’s passion for horses and horse-dealing made me temporarily as besotted with the subject as they are. Novel: Less, by Andrew Sean Greer. Arthur Less, a writer who isn’t quite as celebrated as he would like to be, receives news that his former boyfriend is marrying Another. In order to spare himself the pain of having to go to the wedding, Arthur Less suddenly accepts a series of possibly pointless international literary invitations which have been lying unanswered on his desk. The story of his evasive travels and his ultimate redemption is told in wonderfully crafted, limpid prose. Arts: The Lost Carving, by David Esterly. When the famous limewood carvings by Grinling Gibbons (1648-1721) were damaged in the Hampton Court fire of 1986, American woodcarver David Esterly was summoned to restore or re-carve them, sometimes starting from scratch to reproduce the master’s work. He describes this year of work in entrancing detail. One of the most thoughtful, informative and beautifully written books I have come across on the subject of art, craft, imagination, and the profound insights which can come to the dedicated artist. 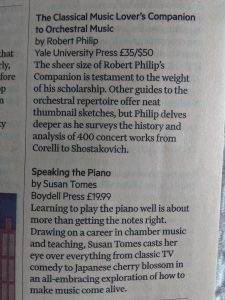 As I’m the one with the website, I’m helping to do some publicity about my husband Robert Philip’s epic study of orchestral music, The Classical Music Lover’s Companion to Orchestral Music, just out from Yale University Press (see photo of the author with his book). 1. Robert has compiled a great playlist of 20 favourite bits of orchestral music, and he’s written a couple of lines about each. The list is on the Yale blog which links through to Spotify, but you can also go directly to the Spotify playlist. Please note that the Spotify playlist doesn’t contain Robert’s words about the pieces; for those, you have to visit the Yale blog. 2. 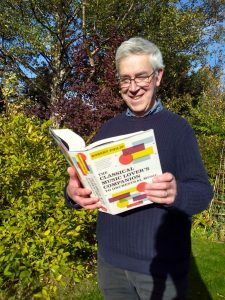 The Edinburgh Reporter has just interviewed Robert about his new book. Scroll down in this article to find a nine-minute audio interview/podcast in which Robert talks about the book. Enjoy the scene-setting photo of him with Edinburgh Castle in the background! Please share these links with friends if you think they’d enjoy them.